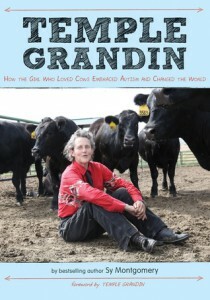 “Temple Grandin: How The Girl Who Loved Cows Embraced Autism and Changed the World” (Houghton 2012) by Sy Montgomery is a book for anyone who is weird or knows someone who is odd. That’s all of us, right? Montgomery assures us that being different does not mean being less. In describing Temple’s relationship to the world, she describes the world of many autistic people. While reading you wonder if many of us are not “on the spectrum.” Loud sounds can feel like torture. Childhood clothes (like a stiff petticoat) felt like “needles stabbing her skin.” Smelling someone else’s perfume was hideous and distracted you from the task at hand, such as school. Sound familiar? As a toddler, Temple did not laugh or smile. She couldn’t understand what people said. She didn’t speak until she was five. Her father wanted to institutionalize her, but her mother wouldn’t allow it. Little was known about autism in the 50’s when Temple was growing up. But her mother found tutors and a nanny who understood that “Temple needed images more than words to understand” the world. Temple thinks in pictures. Many of us do. But Temple retains the pictures in her mind in rich detail and with great accuracy. Instead of being “retarded,” as her father thought, Temple is brilliant. She just processes information differently than that which is considered normal. Her mother enrolled Temple in a small rural school. Eventually her schoolmates took her oddities in stride. Temple learned that what was torturous to her (loud school bell) didn’t bother others. Her classmates were interviewed for this book, offering another dimension to her story. Temple’s major success involves treatment of farm animals. Half of the cattle in the U.S. “are handled in systems I have designed for meat-packing plants,” she says. Her ability to observe details includes Temple’s seeing through the eyes of cattle. She understands what they fear. From her teen years spent on her aunt’s ranch, she learned that cows walk in large circles. Therefore she developed a spiral walkway for the cows to get to the dipping tank. They walk down a stable platform for their bath, rather than being wrestled and dumped into deep water. In order for a steer to be vaccinated, ranch hands, for their own safety, press the animal between two panels. Temple saw the steers calm down. Temple let herself be squeezed in the chute and found that the even pressure calmed her. She built her own squeeze machine and took it to college with her. Temple acknowledges that nature is cruel. We owe cattle respect. She devised a way that steers aren’t afraid and they don’t feel pain. So we can eat our hamburgers with a little less guilt.